Install VMware ESXi 6.5 on Intel NUC (Part 2/2) - T.B.D. 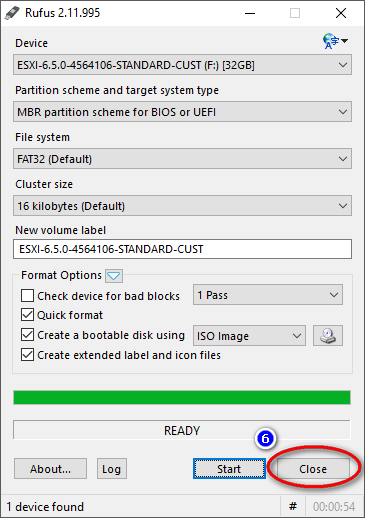 In the first post, we created an ISO image of VMware ESXi 6.5 to install on our Intel NUC. Now we turn that ISO into a bootable USB and do the install. We’re going to use an application called Rufus to create our bootable USB, so download and install it. Now start Rufus. First, make sure that your to select your target USB flash drive in the Device drop down menu. Then, change the “Create a bootable disk using” drop down menu to “ISO Image” (call-out 1). Then click the image selection button (call-out 2) to find and open our customized ISO (ex. ESXi-6.5.0-4564106-standard-customized.iso ). 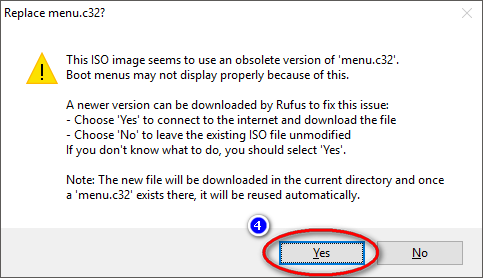 You should now see an updated new volume label which matches the ISO image you chose. Click the Start button to begin building the bootable USB (call-out 3). A warning may pop up about an older version of the ‘menu.c32’ file. This file is part of Syslinux and helps make the ISO/USB bootable. If we don’t replace the older version of the file then our USB won’t boot properly, so click Yes (call-out 4). Rufus will remind you, forcefully, that you’re about to wipe out all the data on the target USB drive. You backed up anything on the flash drive that you wanted to keep, right? If you’re sure you’re ready to continue, click OK (call-out 5). The bootable USB will now be built by Rufus. 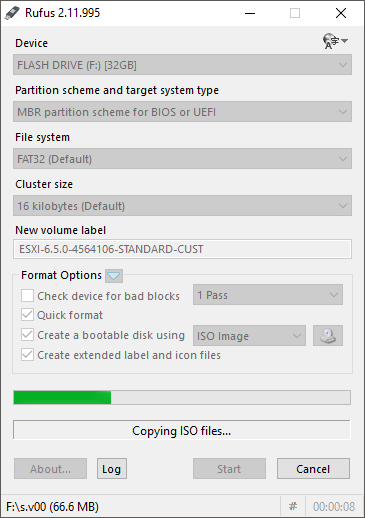 Rufus basically does a bit of work to make the USB drive bootable, and then extracts the contents of the ISO file to it. When finished, you’ll see that the device name has changed at the top, the green progress bar is full, and the status reads “READY”. Click the Close button to exit out of Rufus (call-out 6). 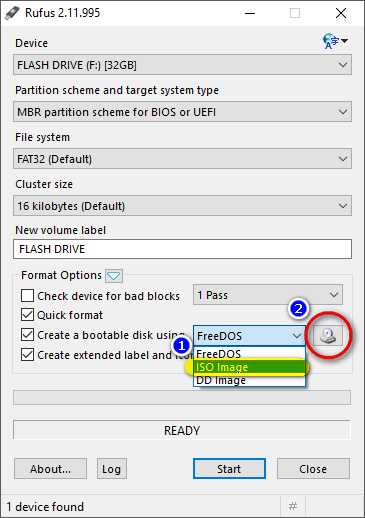 Now you can eject your USB drive as it’s ready for use as a vSphere ESXi installation drive. If you’ve installed ESXi before, this should be really straight forward, and I won’t bother with all the details. Essentially you need to make sure to connect your Intel NUC to a monitor and keyboard, and that the drive that you want to install ESXi into is either installed or plugged in. Remember that in my home lab example, that I’ll be installing ESXi on a USB drive. This means that both the USB drive that we’ve built to install ESXi from and the USB drive that we’ll be installing ESXi to have to be plugged into the NUC. As a reminder, F10 will allow you to select your boot device on the Intel NUC. Then log out of the shell, disable it again and reboot the host. Now that we have successfully installed ESXi 6.5 onto our NUC, we can begin to do some fun and interesting things. Like, say, install ESXi on some more NUCs and then create a vSAN cluster. Stay tuned. 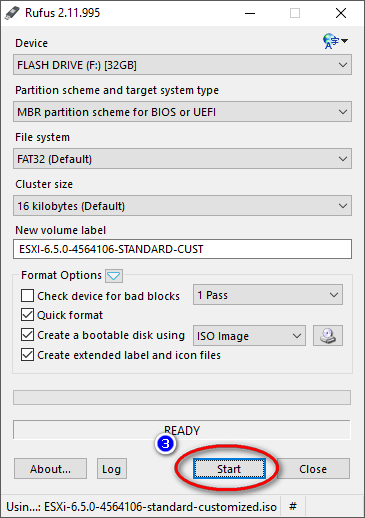 Install VMware ESXi 6.5 on Intel NUC (Part 1/2) - T.B.D. Next story Architecture Principles: Where do they fit in the RAC model?